You are here: Home>Archive>First World War Collection>WW1 Medals and ribbons awarded to Harold Godwin>World War One British War medal ribbon awarded to 4th Class Artificer Harold Godwin. World War One British War medal ribbon awarded to 4th Class Artificer Harold Godwin. 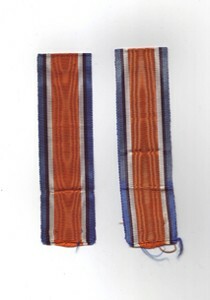 2 lengths of ribbon from a British War Medal. The ribbon has a wide central watered stripe of orange, flanked by two narrow white stripes, which are in turn flanked by two black pin-stripes, further flanked by two outer stripes of blue. Item: World War One Victory medal awarded to 4th Class Artificer Harold Godwin. Item: World War One 1914-1915 Star awarded to 4th Class Artificer Harold Godwin. Item: World War One Victory medal ribbon awarded to 4th Class Artificer Harold Godwin. Item: World War One British War medal ribbon awarded to 4th Class Artificer Harold Godwin.